If you’re one of the many people around the region who rely on Stop & Shop for groceries, the news that Stop & Shop union workers walked off the job on Thursday might have left you scratching your head. About 31,000 workers, unhappy with contract negotiations with the company, last month authorized their labor leaders to call for a work stoppage. And on Thursday, union workers made good on that threat by leaving at 1 p.m. But what does all of this mean for the average Stop & Shop customer? Here, we take a look at some immediate questions that shoppers may have. A Stop & Shop representative reached by the Globe late Thursday afternoon said she did not have specific numbers or locations for the stores that have been affected. However, if your store is located in Massachusetts, Rhode Island, or Connecticut, there is a good chance your local Stop & Shop could be part of the walkout. Company officials said that some stores were temporarily closed and the doors locked “for the safety of our customers and associates.” As of 5 p.m. Thursday, several locations in the Boston area — including Somerville, South Bay Center, Brookline, Quincy, Dedham, and Worcester — have reopened, according to Jennifer Brogan, a Stop & Shop spokesperson. As of 5:30 p.m., Brogan said, the majority affected stores have been reopened. All affected stores will close at 8 p.m. Thursday, and will reopen at 8 a.m. Friday, she said. Some of the stores are getting temporary replacement workers, Brogan said, as workers who tend to have desk jobs (such as in the Quincy corporate headquarters) head in to help ring registers or stock shelves, Brogan said. Additionally, self-checkout lanes are available to customers in the stores that are open. “We are working as quickly as possible to reopen the stores and to minimize disruptions to our customers,” Brogan said. In the meantime, here’s a map of all 134 Stop & Shop locations in Massachusetts. It’s unclear if all stores would have workers rallying outside. 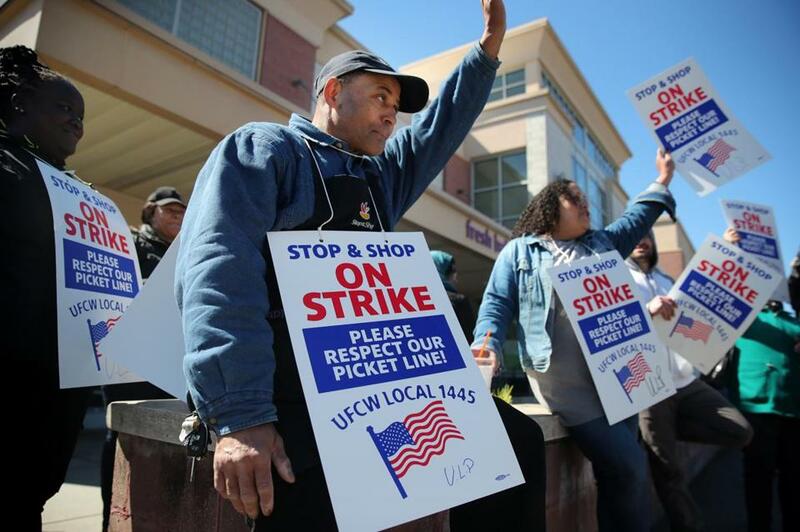 Stop & Shop employees held strike placards outside the Freeport Street location in Dorchester. What do I do if my prescription is at the pharmacy? What about the bank? Even if a store is closed, all pharmacies and banks inside Stop & Shops will be open during normal hours, Brogan said. There will be store managers at the door ready to let any customers in who need to go to the pharmacy or the bank, Brogan said. Several other people noted that Stop & Shop pharmacies seemed to be open in closed stores. A look inside the front door at Somerville?s @StopandShop . There may be some delays with orders, Brogan said, but a couple of tweet replies from the official @PeapodDelivers Twitter account assured customers that the walkout will not affect Peapod deliveries. The striking Stop & Shop employees should not affect Peapod deliveries. If for some reason an issue arises, we will certainly inform you ASAP. As of right now, it is business as usual. However if anything changes, we will certainly be keeping our customers informed. The union did not mention a specific length of time that they plan to walk out for, and Brogan said the company did not have any indication on how long it could last. Stop & Shop is the biggest grocery chain in New England by market share, according to Shelby Publishing Co., owner of The Griffin Report of the Northeast. Shelby Publishing breaks down New England into two markets — east and west — and Stop & Shop rules both. In the west (Hartford/Springfield/Montpelier) region, Stop & Shops saw 40.7 percent of the market share, while the company saw 22 percent in the east (Boston/Providence/Manchester/Portland/Bangor) region. Why are the union workers so upset? The Stop & Shop workers — represented by five separate UFCW unions — had remained at work since their contracts with the grocery store chain expired Feb. 23. However, the union hasn’t exactly kept quiet about their concerns. A group of workers and supporters marched through a Somerville store in March to demand a fair contract. The union president said at that time that union leaders oppose the company’s proposed contract change, which they said would cut wages, pensions, and health insurance. The company has also cut staff and relied more on automation, he said. The union said in a statement on Thursday that the company is flush with cash. What is the company’s stance? Stop & Shop officials said in a statement Thursday that they were “disappointed” with the union’s actions, and said it was still trying to negotiate as recently as this morning. Travis Andersen, Martin Finucane, Jon Chesto, and Matt Rocheleau of the Globe staff and Globe correspondents Max Reyes and John Hilliard contributed to this report.